BMW builds the 5 series in Dadong. FRANKFURT -- BMW said its annual production capacity in China will reach 450,000 vehicles, 144,274 vehicles more than last year's output, once an investment plan to upgrade its local factories is completed. BMW produces cars at two plants in Shenyang, China, and has invested 1 billion euros to adapt production lines for newer models over the past three years, the automaker said in a statement Friday. At its factory in Shenyang's Dadong district, BMW now produces a long-wheelbase version of the 5-series sedan and is preparing to build the X3 SUV at a factory, which is run by its joint venture partner BMW Brilliance Automotive. 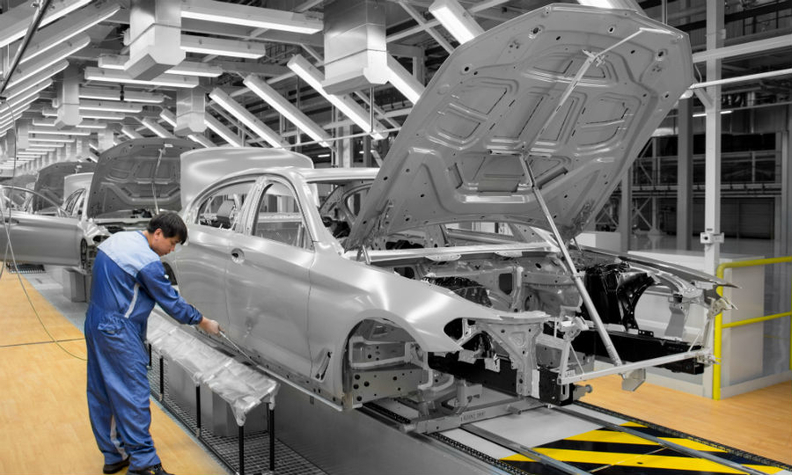 BMW is now remodeling the a section of the Dadong plant to increase the factory's flexibility, while another plant in Shenyang's Tiexi district builds a long-wheelbase version of the X1 SUV, a 2 series, a long-wheelbase 3 series and a 1-series sedan. A new center to assemble high-voltage batteries for plug-in hybrid vehicles is also under construction and is due to be opened later this year. In 2016, BMW sold more than 516,000 BMW, Mini and Rolls-Royce models in China. This year the group plans to launch 14 new or revised models in China. Last year the joint venture built a combined 305,726 at its two factories. The Tiexi plant produced 161,901 vehicles and 143,825 were made in Dadong, BMW told Automotive News Europe.